Make it Fun & Fancy, Make it Chenille! For the sweet baby blanket pictured we used three layers of a the Urban Zoologie Panel from Robert Kaufman (designed by Ann Kelle), plus a backing fabric, and lined up the printed panels as close as possible. We suggest using 505 Adhesive Fabric Spray and a couple of basting safety pins to hold the layers together and to prevent shifting. The backing can be a fabric of your choice, and we chose to use a flannel to make it cozy for kids! It’s a good idea, if you can, to have your backing be a couple of inches bigger all around, making it less likely that you’d cut through it. Once you have all your layers together, it’s helpful to place a long strip of blue tape from corner to corner as a straight line sewing guide for your channels. Additionally, you’ll want to use a walking foot (or Bernina DUAL FEED option) on your sewing machine to make sure the positioning of your layers stays the same. With the ability to cut through up to eight layers, the Chenille Cutter has various guide widths that assist in giving your quilt more or less of the ridged effect. All you have to do is slide the Cutter through the channels of your top layers to achieve the Chenille technique. For a softer fluff, make your channels smaller and use the side of the Cutter that is 1/8” or 1/4″ wide. 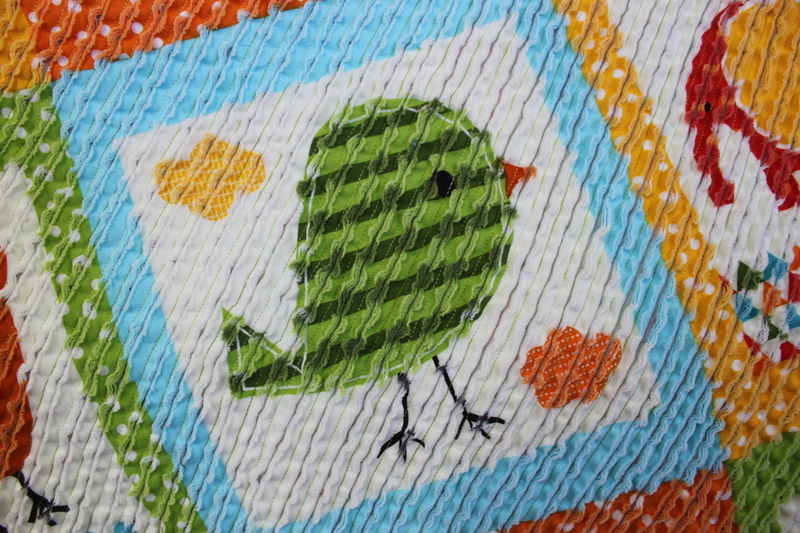 If you wish to preserve the print of the fabric a little more, sew wider channels that can use the 3/8” or 1/2″ sides. We used 1/2″ channels on this panel print to better see the large animals. The pillow is made with smaller channels, making the material softer with more frayed edges. Once you have finished all of the cutting, just bind the edges and run that puppy through the washer and dryer to reveal the fantastic fluff of the chenille! And it doesn’t have to be just for quilts! Check out this pillow. Maureen (left) is holding the pillow. 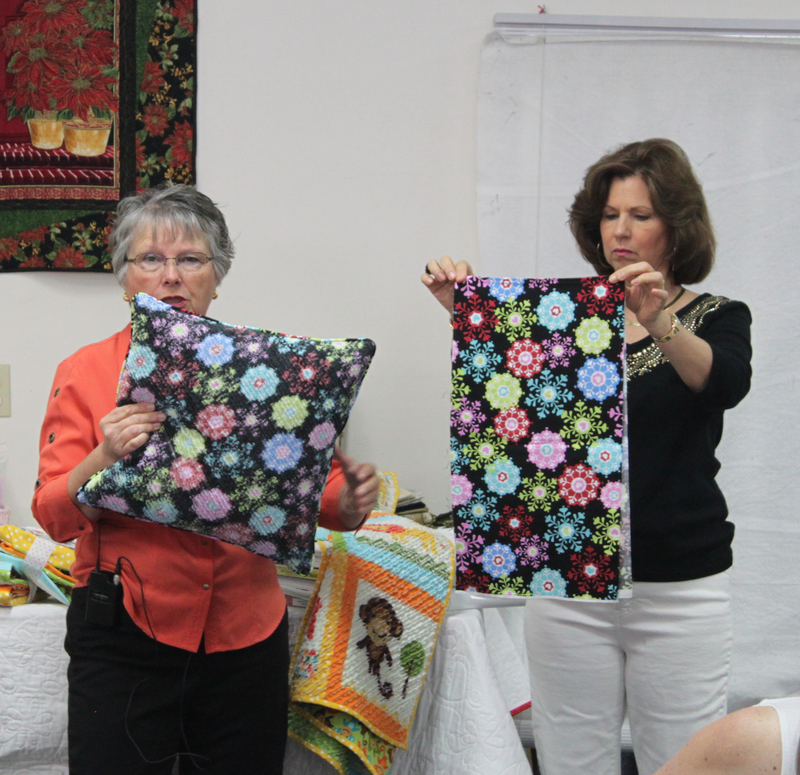 Kathy (right) is holding the original fabric. 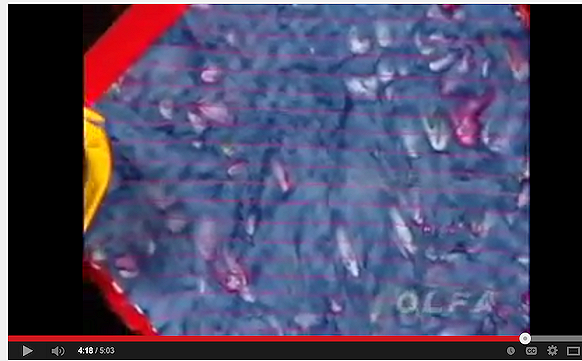 Here you can start to see how fuzzy the chenille gets in both texture and color!